Christine Sajecki’s encaustic paintings are dreamy and sometimes allegorical explorations of her surroundings. They are informed by history and storytelling, the body, and the behavior of the materials she uses. Her surfaces are built of wax, pigment, collage and direct transfers of imagery from found materials. These layered compositions include material artifacts, landscape forms, and figurative arrangements that speak to social narratives that echo and overlap from one generation to the next. 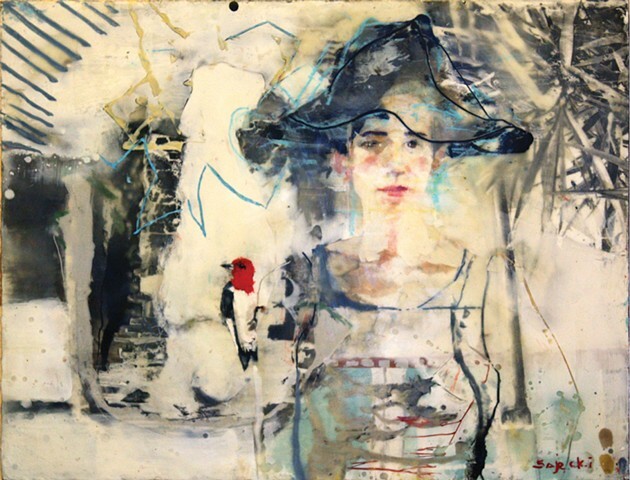 Her encaustic paintings read like literary fiction: communicating with sincerity and immediacy an evocative arrangement of history, memory, and lived experiences.